There's a winter storm warning in effect for Ottawa-Gatineau, calling for 15-25cm of snow followed by freezing rain. 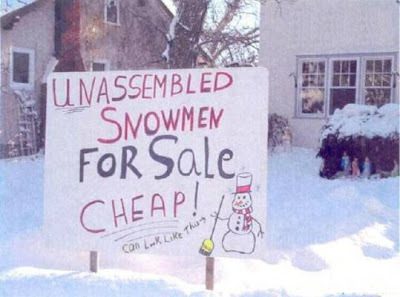 So, plenty of raw materials - as it were - for snowmen. Does this Bike Make Me Look Fat? "Wouldn't A Dow Go Good Now?" The Highest Form of Flattery?